When an alien species detects the dissolution of a planet in a neighboring solar system, they send out a group of skilled teenagers to save what they can of the planet. This is an intriguing setup to a novel that is high in social commentary. What was your moral goal when writing this novel and do you feel you’ve achieved it? My goal in writing this novel was to attempt to describe this world from the point of view of outsiders – people who had not been born and raised on Earth; people not conditioned and tainted by the absurdities of everyday life on this planet. Aliens. As a vegan, an atheist and an anarchist, I am dismayed on an, almost, hourly basis by the irrational behavior of my fellow species. We call ourselves ‘civilised’ and ‘highly evolved’ yet we participate in practices so horrific that, when committed against humans, are, quite rightly, thought of as shocking and unlawful yet, when perpetrated against non-human animals, are considered perfectly acceptable – or, usually, not considered at all. We call ourselves ‘intelligent’ yet we homo sapiens, we self-proclaimed ‘wise men’, are, not only, allowing the very environment we totally rely on for our own lives to be destroyed to slake the greed of a tiny number of other human animals but we are blissfully helping them to do so by believing their lies and consuming their unnecessary and harmful products. Some would call us ‘enlightened’ but up to 95% of all humans truly, truly believe that they will be transported to some kind of paradise after they die! Why should they care if life on the physical world were to be destroyed? I suppose that could explain why we do not care about the destruction of the rain forests, the desertification of vast swathes of the land, the befouling of the atmosphere and the creation of massive dead zones in the ocean. Also, how civilised or evolved or intelligent or enlightened can we be if we are killing and being killed by each other for nonsensical reasons such as the ancient writings of those ‘Religions of Love and Peace’ or the greed-based ideologies of power-hungry politicians? There are countless other stupidities I could mention here but the divisions based on race, colour, gender, sexuality, ability, age and, yes, even nonsensical superstitious belief, spring to mind – all of which I do discuss in the novel. Obviously, I cannot mention all of those forms of discrimination without also mentioning speciesism which plays a huge role in informing the aliens and, naturally, the book. Did I achieve my goal? From a practical angle – that is, putting myself in the minds of total outsiders and viewing the world afresh – I like to think that I did pretty well. However, in other aspects of the work, I am not so sure. the hell world is full of detailed characters and places. How long did it take you to imagine, draft, and write this world? The whole process took about 2 years from conception to pre-publish and then about 9 months to get the novel out. There was a lot of research involved – all of the figures I cite as being facts, to the best of my knowledge, are actual facts – the sixty-billion non-human land animals slaughtered for food every year, as just one example. I did, perhaps, use some poetic licence when detailing some of the projections of the aliens – on predicted human population levels, where, I think, I suggested that the numbers of humans alive in 2050 would far exceed the predicted eleven-billion – but I do not believe I took too many liberties on their behalf. Their are many animals on this hell world. Were these animals allegories for humans on Earth? What was your favorite animal to create and write for? This is an area where I obviously failed in my writing because the portrayal of the dominant animals, the Kaahu, on the hell world was not allegorical – they are humans and the hell world is Earth. There were no metaphors, no cryptic clues; the novel was set here and now on this planet with you and I as players in the story – there are many, many pointers to this fact in the book! My favourite character is Hentanayre – she’s a bubbly, intelligent young female alien (an ap Vandan) who loves all animals (except, maybe, the Kaahu) and, just like me, is terrified of heights – we have a lot in common! What is the next book that you are working on and when is that book due out? I am in the planning stage of a new novel – again, written from the viewpoint of aliens… mainly. I do intend to intersperse the narrative with a human voice here and there. It will also be written, again, from a vegan, atheist and anarchist perspective – so plenty of anti-carnist, anti-god and anti-hierarchical stuff. My working title is ‘It’ but I have no idea when it may be finished or published – I am in no hurry. 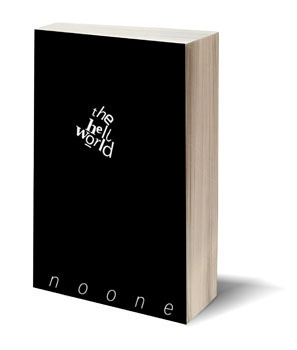 the hell world is a work of fiction that seeks to highlight the absurdity of the human condition as seen from the vantage point of outsiders – an alien view. It is a critique of the now in the genre of science fiction; an attack on all of the ridiculous ideologies that have retarded, and continue to retard, the evolution of those, self-proclaimed, wise men (homo sapiens) of the planet. These nonsensical philosophies, be they socio-political, economic, military or religious, have all crippled human animal evolutionary development for millennia. But not just that. Of much more importance is the impact that just this one species of animal has had, is having and will continue to have on all other lifeforms of this beautiful world and on the planet itself – though, I fear, not for too much longer. An unthinkable, unmentionable, unconscionable number of individual, sentient beings are slaughtered for human consumption in their multiple-billion every single year. Habitats essential to other lifeforms have been, and continue to be, destroyed on a regular basis, affecting the very existence of thousands of species of animal and vegetable life – in itself an act of mass suicide for human animals as all of those other lifeforms are part of the cycle of life. All are interdependent – taking away one leads to a domino-effect and, albeit at first slowly, the whole structure starts to collapses. We have passed that initial, gradual degradation stage – it has long since gone. Also an environmentalist, n o o n e cannot comprehend the idea that human animals are nonchalantly destroying the planet – an action which can be likened to people steadfastly hacking away at the foundations of a borrowed house and constantly defecating in every room whilst kidding themselves that they can pass that house on to their children. Couple those atrocities to the insane befouling of all of the water and the entire atmosphere of the planet by this species, the unconscionable weapons of mass murder they possess, then add-in the sheer number of these human animals and their determination to increase that total without limit points to just one, inevitable conclusion: The total annihilation of, not only themselves, but of life itself on this one world in a million or billion or trillion or, perhaps, the only planet like it in the entire, vastness of the universe. We will never know because, the sad truth is, it is much too late for the human animal, much too late for other species of life and much too late for the planet.